2008 is starting out with a very busy schedule. It’s fun going through the call for entry art competition lists to see what exhibits it might be possible to get a piece of artwork into. For your enjoyment today, I decided to bring you another one of my Artist Trading Card miniature pieces. 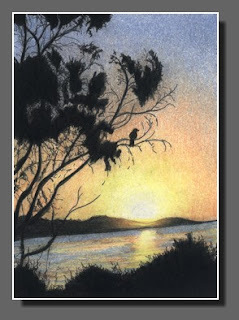 I love this little lake scene with a bird in the tree watching the sun descend over the water. This Silhouette Sky is done with Primsacolor colored pencils on bristle board. The sky is a mixture of blue and clouds here in southern Michigan today and it’s in the 20s. We still have a thin layer of snow on the ground from the weekend snowfall. Hope everyone is staying warm and cozy!